If you are a hockey fan with a Twitter account you are most likely very familiar with painful complaining. It seems that every NHL beat writer, hockey sportscaster, and virtually everyone I follow from Canada has been lamenting the NHL lockout on Twitter for a couple of months. Is it deserved? Yes, absolutely. Will it change anything? Obviously not. I am just as guilty as everyone else of producing these depressing tweets with the hashtag #EndTheLockout, but it is getting hard to stay optimistic. With the league and the NHLPA meeting tomorrow, I feel uneasy. Negotiations feel like they are getting down to the wire. Either there will be a shortened season or we will have yet another full-season lockout. The precedent the NHL has set for lockouts is a huge problem and there is speculation that fans might fight back this time. But with the most tribal fans in the US and Canada, would a Bruins or Canucks fan really stop buying season tickets and merchandise? Honestly, I don’t think so. The fans are clearly the losers in this battle between the owners and the players, but who else is losing? 1. The Fans– this is incredibly obvious. As a fan myself, I know just how awful this lockout is. And as I waited to for the lockout to end during the Presidential election (which clearly didn’t happen), I secretly hoped someone in the audience at the debate would ask about what Romney and Obama would do if they were at the bargaining table. Although that question wasn’t asked at the debate (which in retrospect is a very good thing), Obama did talk about it on Jay Leno- and he was right on the money. Good job Barack, you got my vote. Thanks for addressing the most important issue plaguing America today. 2. Teemu Selanne- Selanne, an unquestionable future Hall of Famer, is 42 years old. He is at the end of his career and this lockout might cost him his last hurrah for the Ducks. When asked if he would not play in the event of a full season lockout, Selanne said this, “Probably. It’s hard to say for sure, but year after year it’s getting harder and harder to get ready for the season. When the season starts, it’s going to be fine. But doing all the right things at this age, that’s the hardest part. But, you know, I’m more sorry about this hockey world and these younger players. I would be sad to go out like this, but I got more than I really dreamed out of it.” Depressed yet? What about when Joe Sakic had this to say at his HHOF induction, “I lost a year of hockey. It would have been 21 years instead of 20. That’s what you lose.” Okay hold your tears Anaheim fans, I still have three losers left. 4. The Minnesota Wild- The Wild made potentially the move of the year with the off-season pick up of free agents Zach Parise and Ryan Suter. No doubt Minnesota paid a ridiculous amount of money to do this, but there was a palpable excitement in the air. I watched on Facebook as my friends who are Twins fans posted about hockey (which is a huge deal). Will Minnesota be able to keep up the hype without any games? Maybe, but definitely not like what it would have been if the season had started on time. According to USA Today, “They have sold the equivalent of about 4,000 new season tickets since the day the 13-year, $98 million contracts for Parise and Suter were revealed, signaling the most-anticipated season in the franchise’s 12-year history. Thanks to the NHL lockout, though, the mute button has been pushed on the buzz.” And who likes a buzzkill? No one. 5. Team/League Employees- As a student studying Sports Industry Management, I really feel for the Team and League employees who are getting royally screwed over by the lockout. One day your job is secure and the next the St. Louis Blues are laying off 20 employees and dishing out pay cuts at the speed of light. Not to mention everyone trying to find a job in hockey (gotta love hiring freezes right when I am finishing graduate school). Some employees are being downgraded to four-day work weeks and some are taking permanent pay cuts. FAIL. Other notable losers: The Pittsburgh Penguins who were favored to win the Stanley Cup, League sponsors, NBC Sports, and the City of Detroit. And that’s how the cookie hockey season crumbles. Newest Bleacher Report Article on the Penguins. Check it out! What is going on in the hockey world you ask? Simply, a lot. With LA’s Game 1 OT win over the Devils in the Stanley Cup final, the NHL Combine taking place this weekend, the EA Sports Cover Vote coming to a close, and Lidstrom announcing his retirement, fans are in the thick of tons of hockey news. 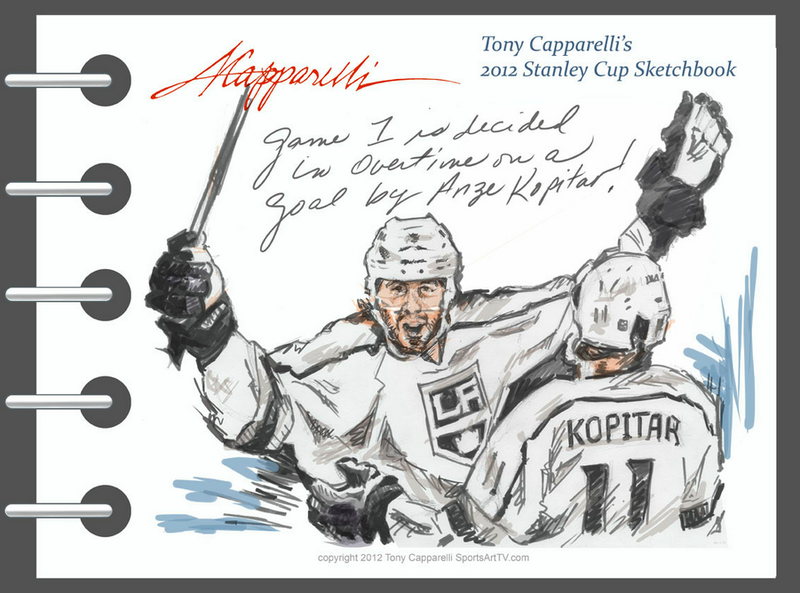 Sidenote: The Kings have never won a Stanley Cup. For those of you who think that is no big deal, consider the fact that the Kings became a NHL team in the 1967 NHL expansion with the California Seals. Sidenote: Lidstrom has played 20 seasons with the Red Wings, and is still just as good as he was way back when. I mean, he won 7 Norris Trophies for being the league’s best defenseman. Check out his first goal ever here. 3. The NHL Scouting Combine finished up interviews with potential players and have now moved on to test athletic ability. The Combine takes place in Toronto from May 28th until June 2nd. TSN draftcenter is covering everything you could ever want to know about the Combine. Various players in the top of the scouting class have injuries that are not quite healed. No one knows just how the injuries will effect the players’ draft position (Most notably Alex Galchenyuk’s knee injury). Yeah ouch. Sidenote: Malcolm Subban, PK Subban’s brother was at the Combine. He plays goalie. Who knew? Sidenote: Top defenseman prospect Ryan Murray ended up vomiting after the Combine’s bike test to check oxygen consumption during intense exercise. To reporters he stated, ““I lost a little bit of my breakfast…too much bacon this morning.” Sounds like a comment an 18 year old would make. Oh yeah, he’s 18. Younger than my younger brother. Scary. 4. 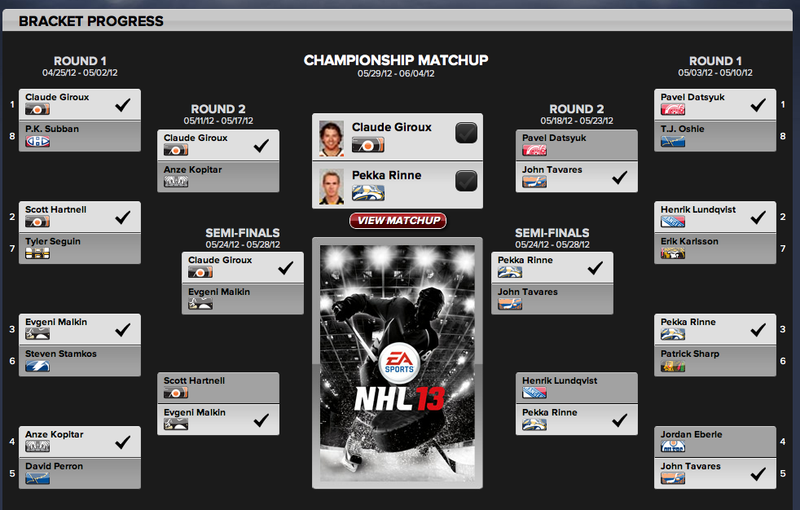 EA Sports Cover Vote for NHL 2013 has been narrowed down to only 2 candidates: Flyers’ Center Claude Giroux and Predators’ Goalie Pekka Rinne. Voting lasts until June 4th and the support for both candidates on Twitter is ridiculous. Giroux put out a message to fans on his own Twitter account, while celebrities like Carrie Underwood have come out in support of Rinne. 6. Trades to watch out for: Rick Nash, Jordan Staal (Headed to Carolina with his brother? ), Ryan Suter (Lidstrom’s replacement? ), and Zach Parise (unrestricted free agent this summer). Sidenote: And what about all this Tim Thomas craziness? Bruins GM Peter Chiarelli confirmed that “There’s a strong chance he’ll [Thomas] be taking the year off.” Why? Because he is Tim Thomas and he does what he wants. That was clear when he didn’t go with the rest of the Bruins team to the White House. Does he want to be traded? His no-trade clause does expire on July 1st… Time will tell. Yesterday was the NHL’s trade deadline. I was excited and ready for something crazy to happen. As expected there was tons of talk about Rick Nash and his desire to be traded (Blue Jackets GM, Howson, even came out and said Nash asked to be traded- see update comment on Rick Nash article). But nothing really happened. Yes, trades were made, but was anything really substantial? No, probably not. In fact, the trade deadline ended up being so boring compared to other years, the people tweeting trades had to discuss trades that were being turned down rather than accepted. I don’t know how many times I had to hear that the Sharks were not willing to offer up Couture for the Nash trade, or the Rangers didn’t want to dissipate their young core of players by paying too much for another forward. And then their were the players reactions on twitter. These ranged from thanking the city they played in, welcoming new teammates, to tweets from players not being traded at all. It seemed that everyone was trying to buy star players, but no one was willing to sell. Some teams (the Pittsburgh Penguins, Washington Capitals, Calgary Flames…etc.) did not make any splash in the trade-realm at all. No one was traded or added. The overall count for trade-deadline Monday was 32 players involved with 11 draft picks and 16 trades. The team with the biggest moves seemed to be the Nashville Predators. They traded draft picks and prospects for winger Andre Kostitsyn, center Paul Gaustad, and a 4th round pick (not to mention their acquisition of the amazon-of-a-defenseman Hal Gill last week). The Preds are making moves because they want the cup now. With some of their best players’ contracts ending in the next year or two (including Shea Weber and Ryan Suter), they need to make their cup push as soon as possible. It is hard to say if the choices were really worth the price though. What happens if Weber and Suter leave and the Preds have no young prospects? This years trades were definitely fueled by short-term rather than long-term goals for Nashville. At this point, it is also hard to tell who the winners really were this year. The consensus around the NHL is that the Canucks made some nice trades and really lucked out with their trade for Pahlsson. This was another short-term push for the Canucks who are itching for the Stanley Cup. They ended up trading off one of their best prospects, rookie Cody Hodgson to the Sabres. I am just left to wonder what will happen to these teams in the upcoming years with all these short-term goals. Are the acquired players for the Canucks and Preds good enough to take them to the Stanley Cup? To be honest, the Canucks probably have a better chance than the Preds. Do you think any deadline day trades will be particularly successful? Were you disappointed with the lack of big moves made? To see the other trades that took place, feel free to check out my twitter page at http://www.twitter.com/fiveforboarding where I was tweeting the trades on Monday as they were happening.